Thanks for following along as I blog about my experience doing the Insanity DVD's. On that first day, I was really nervous. Month two began a whole new series of workouts. They are longer and more intense. Was I ready for this? I had the fit test and then the first work-out of month two, Max Interval Circuit. I thought it seemed like too much to do the 25 minute fit test and then the new longer one hour work-out back to back, but this was on the schedule, so I had to power through. I was really happy with the results of my fit test! I improved on every exercise except for the globe jumps, which for some reason I haven't been able to reach the same number I reached on my very first fit test. I wonder if hubby counted wrong the first time, how is that possible? After the first workout in the second month, I felt a sense of relief. All in all it wasn't as bad as all the hype. I really read some scary things online about how hard month two would be. Seriously, it is not that bad. Don't misunderstand, I still couldn't keep up with everything, I was still dying, but it was manageable. I could do this! It was kind of like month one, but a little longer, with some new more advanced exercises. I like the poster below with Shaun T. If you can get through it all, then you probably are not working hard enough. 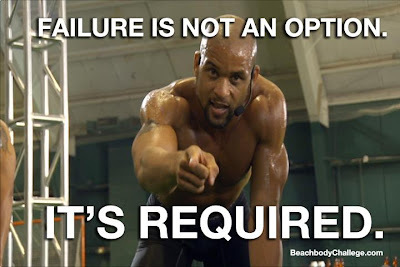 You are supposed to fail in each and every workout. You are supposed to have to stop and take breaks. If it was easy, it wouldn't be Insanity. The only real failure is quitting and that is not going to happen. Immediately following my first workout, I developed a pounding headache. I didn't think anything of it, took two Tylenol and went about my night. On the second day I felt fine all day at work, but as soon as I started the warm-up, that pesky head-ache came back. I fought through the warm-up and stretching but my head-ache was only getting worse. 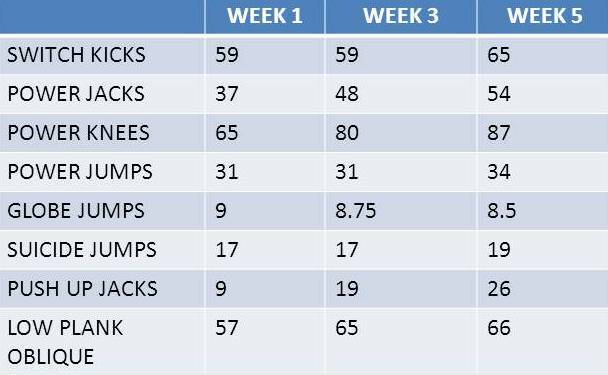 This was the Max Plyo day, so when they moved into the first jumping exercise of the regular workout, I realized I couldn't continue. I had to turn it off. It took two more Tylenol and felt better a short time later. I had hoped this wasn't becoming a trend, but I wasn't going to beat myself over this though. I was into the second month of Insanity and the very first workout I missed. No big deal. Skip it and move on. My results wouldn't be diminished by one missed work-out. I really started to get frustrated when it happened again on both Wednesday & Thursday. Both times about 20 minutes in. It wasn't debilitating, so I pushed through to the end anyway, but it was definitely effecting my performance. I was frustrated that I couldn't give the workout everything I had. What is going on? I did some research online and everything I read said it probably is related to not enough calories or dehydration. I drink a ton of water every day and I generally don't drink caffeine. I follow the calorie calculator that came with the program and eat about 2000-2200 calories a day, so I didn't think that was it. Maybe I needed even more calories now that I've moved into month two? On Friday, I decided to eat a much bigger lunch than usual to see if it had any effect. I was willing to use any excuse to go to my favorite local Mediterranean buffet and load up on the best hummus on the planet. On both Friday and Saturday I completed the workouts without a headache! I was so relieved! I'm not sure if it was the food or not, I did notice on Friday in one of the killer warm-up exercises called 'side to side floor hops' that I started to feel a little head pain, so I stopped doing that exercise and it never developed into anything. Could it be that exercise? Fair warning to my male readers, girl talk about to commence. I was on my period those first four days when I was getting the headache. I'm not sure if there is any correlation there. Whether it was the calories, my period or that insane warm-up exercise, I was just happy that the headaches seemed to have stopped. It gave me a renewed sense of gratitude for being able to complete the workouts, rather than complain about their difficulty. It really is a privilege to be healthy enough to exercise at this level and I will work hard to remind myself of that fact. It is easy to forget. There were days when I didn't feel like doing it. I did it anyway. There were days I was tired. I did it anyway. Every day I hit play on the DVD player and that is the key to my success so far. You don't have to do it perfectly, you just have to do it. Running has really taken a back seat to Insanity. It is too much on my body to do both. I have been lucky to get one good run in a week. I miss running a lot and look forward to returning to it. I plan on continuing with the Insanity workouts three days a week and running three days a week once I officially complete the program. Right now, six days a week of one hour Insanity sessions and running on top of that proved to be too much. When I attempted to run on Insanity days, my legs were sluggish and my pace was slow. After completing the first two weeks of month two, I feel great! I generally enjoyed the month two workouts even more than the ones in the first month. I can't believe I only have two weeks to go, the time has flown by! I can't wait to compare my before and after pictures, measurements and body fat percentage at the end. Although my weight is exactly the same as when I started (that is a good thing, I was worried about losing weight), I think I can see more defined muscle definition in my obliques already. It will be interesting to see the before and after pictures side by side. I'll share them with you once I complete the program! Hope it was just 'that time of month' with the headaches!! Glad they seem to be gone. You are doing great!! I'm actually on day 3 of my second month and also having this problem everyday after the workout I have this horrible migraines. I'm going to try upping my water intake more before working out to see if this helps. 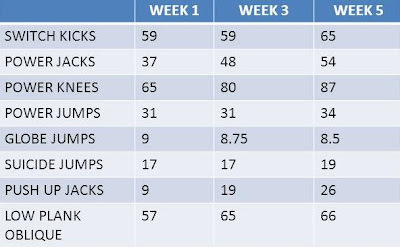 Month 2 is killer already for me but I change in workouts are fun, just have to get better endurance. I feel like week 1 all over again.